peanut butter mill and peanut butter programme. Warm, fresh, pure peanut butter ground from wholesome, sun-drenched, hi-oleic Australian peanuts. No added sugar, salt, oil or chemicals. Gluten free! 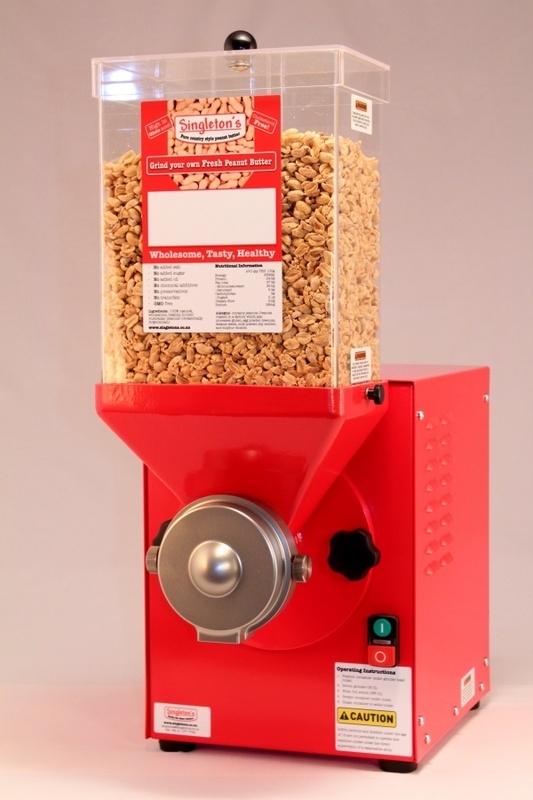 Impress your customers with the opportunity of freshly grinding their own 100% natural peanut butter and grow your nut sales by installing a Singletons Peanut Butter mill in your store today. Either buy a peanut butter mill outright and source your own nut feedstock or join the Singletons Nut Butter Programme and enjoy the peace of mind that comes from no outlay or responsibility as we outfit and manage the operation for you. Singletons not only manufactures and markets a compact commercial, counter-top Nut Butter Grinder intended primarily for usage in the retail food industry, but also offers a co-operative programme with eligible trade partners in the retail food industry. In addition we can contract manufacture gourmet Peanut butter for resale by food retailers. commented on "Since late 2014, the Bin Inn group of food markets has decided to purchase our Singletons™ Peanut Butter Mills for customer self ..."
Bin Inn Group chooses Singleton! commented on "The new Countdown in Ponsonby now has a bank of Singletons Nut Butter mills for customer self service Nut Butters. ..."
commented on "The stainless steel auger in the Singletons Peanut Butter Mill has been redesigned. The upgraded model has a significantly higher ..."
Subscribe to be kept abreast of all new developments or products at Singleton's.